→Vortex Sparc 2 Red Dot Review–Quality & Versatility First! Finding the right scope for your gun can be an immensely annoying task, especially if you want something versatile & reliable at the same time. Well, that’s precisely where the Sparc II from Vortex can help you; a well-made and reliable design for the dynamic user who wants much more than a simple scope. Having the Sparc II is immediately getting one of the best versatilities in the market. Not only you will be able to use it on any medium-sized semi-automatic rifle, but almost on any other gun including shotguns, submachine guns, and even big pistols if needed. The aircraft-grade aluminum build is usually well-made and resistant, but this one from the Sparc II is much more than that. With a nitrogen gas purging build style, the device is capable of supporting water and fog, delivering a sealed entirely construction that lets no contaminant harm your aiming experience. Then you have the O-ring sealing method, which allows almost no moisture, dust, debris, or just whatever to penetrate your scope. This provides users with a high-quality, reliable performance that practically no other accessory can offer. On top of all that, you also get a top-notch rugged build. The perfect construction that will make the device capable of standing the hardest of shocks and whatever impact you give it – so you can use it in more active & demanding scenarios without worrying about the scope at all. The Sparc stands for Speed Point Aiming for Rapid Combat, so it wouldn’t make sense if it didn’t offer a quick-response design for those who needed a faster performance while shooting. And for that, it needs to be small and light, of course. The design is one of the smallest at the price-range, and thanks to how well-made it is, you can use it on almost any type of gun including AR rifles, sub machine guns and even shotguns and small semi-automatic rifles as well. Whether it is for tactical training or active close-range shooting, the ultra-small & light design of the Sparc II will undoubtedly provide top-notch performance, even in low-light settings. A famous red-dot reticle is always an outstanding option for those who want more visibility at night and a more precise and accurate aiming. Apart from this, the red dot is a lot more durable and reliable, without harming construction of the scope and always offering an easy-to-use aiming mode. 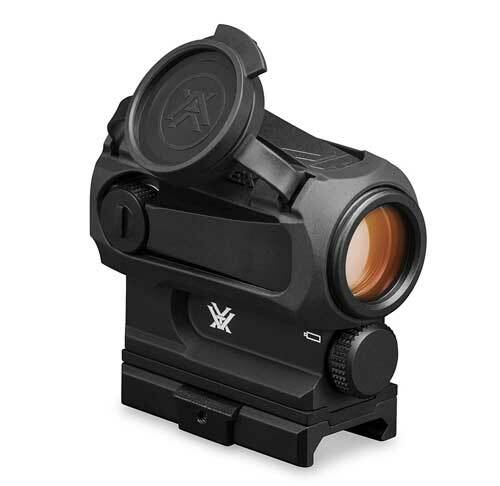 However, what makes this red-dot reticle design stand out is the ability to offer a 2 MOA fast design, plus ten illumination settings to use in low-light environments and at nights. This makes the red-dot reticle one of the highest qualities out there and makes the whole scope one f the most convenient overall. 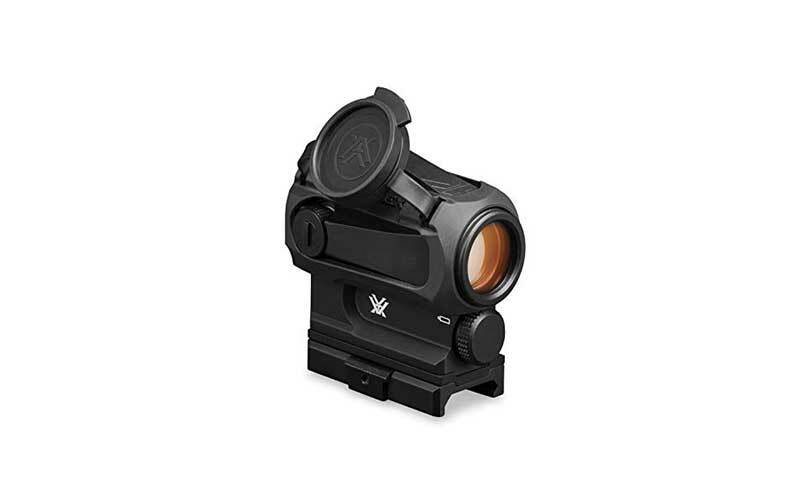 Not only is the optic interesting with its red-dot reticle, but it is also one of the best regarding visual quality, providing not only the ten-level illumination adjustment but also an immensely durable & resistant construction. The anti-reflective coatings, also, increase the amount of light you can get on the scope. While aiming, shadows and dark areas will look brighter than needed, so you will be able to catch even the hardest of targets without having to make much of an effort while aiming. One of the things that sets the Sparc II apart from the crowd is the ability to provide a wide variety of accommodations & adjustments to meet more demanding users’ expectations. The Sparc II comes with a multi-height mounting system, so it fits almost any type of gun without problems. It also fits 1/3 co-witness models, Weaver standard mounts of even Picatinny bases in case you don’t have the standard ones. But the convenient part of the Sparc II is the three-piece base, which allows users to have a more specific modification depending on which gun they use. Whether it is 18.0 mm, 21 mm, 37 mm, or 40mm – the device will provide the perfect height and position for almost any gun, always according to the user’s desires. Maybe the only drawback you will find on the Vortex Sparc II – the adjustment knobs that could become slightly uncomfortable when using. There are two reasons these knobs feel somehow annoying to use. The first reason Is that the knobs are too close to each other, so when you use one for windage & elevation, the brightness knob is so close that you may end up using the other by mistake and ultimately harm your experience while adjusting the scope to your needs. The next reason is the softness of the knobs. Being so small of scope, the knobs didn’t include the hard click sound that most scopes have. It still has the sound, but not as loud as others, so making changes may eventually become a real challenge, especially during noisy & harsh environments. Yet, the adjustments are very responsive,and you will get excellent reliability. But of course, you will have to get along first with its design before making a comfortable use of the Sparc II. Is the Vortex Sparc II a High-Quality & Versatile Scope? Providing a short-range tactical use with a semi-automatic rifle or any short-range gun such as a shotgun – the Sparc II will offer much more than you can expect. Thanks to a highly versatile design, using the Sparc II red dot from Vortex feels piece of cake. You will obtain top-notch optical quality, a durable construction, and a great convenience that is almost unmatched by any other model from the same brand, no matter where you mount it. When you consider all of this, plus the ability to be used even during low-light environments, the Sparc II becomes an indisputable well-made choice no matter your needs. Even taking into consideration the fuzzy adjustments, you will still get an impressive scope.